Exercise for the neck is very important since weak muscles are related to many symptoms in the neck and can contribute to fatigue, irritability, headache, sleep loss, and more. When done correctly (perform slowly, staying within “reasonable” pain boundaries), they can increase your range of motion, reduce stiffness/tightness, and strengthen your neck muscles. The exercises combine range of motion (ROM) against light/partial resistance in 4 directions. To do these correctly: 1. 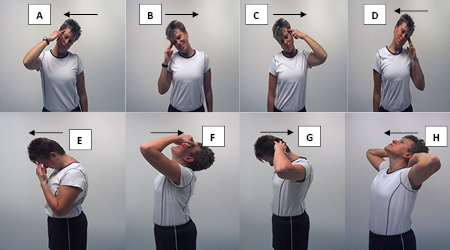 Push your head into your hand while moving the head to the end of its motion, “…letting the head win” (See A, C, E, G). 2. Repeat this going back in the opposite direction by “letting the hand win” (see B, D, F, H), again, moving through the entire range of motion. ALWAYS push the head into the hands, Make sure you move the head against resistance in BOTH directions, 3 times each (A-B then B-A x3; C-D then D-C x3) then, (E-F then F-E x3, and lastly, G-H then H-G, x3 reps). The trick is doing this VERY slowly (to build motor control and coordination) and to move through the entire “comfortable” range of motion. Repeat 3x slowly. If pain worsens, lighten up on the amount of pressure used or stop the movement just prior to the sharp pain onset. If you can’t make it to the end of the movement due to pain, make a note of how many reps it took before the onset or increase of pain and how far you could move your head. Do 3 slow reps and then move to the next exercise direction. These exercises can be performed 1 to 3x/day according to tolerance and will increase ROM, increase strength, and build coordination, all at the same time. ChiropracTIC is the science and art of finding and correcting vertebra that are misplaced and causing neurological dysfunction. By moving the vertebra back to its normal position and allowing the command and control system of the body (the nervous system) to function at optimum performance, your body is free to function as it should. Call today to schedule an appointment with your chiropractor.